In this part I will describe about microcontroller's interrupt . You must learn about this , it's really important !!. 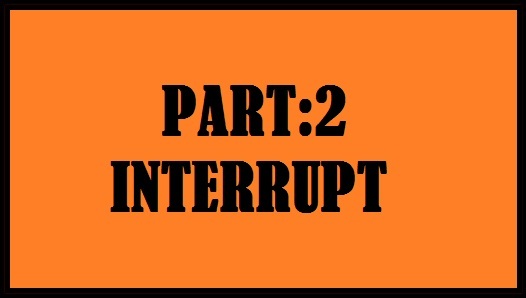 Interrupt means , make a restriction to something. 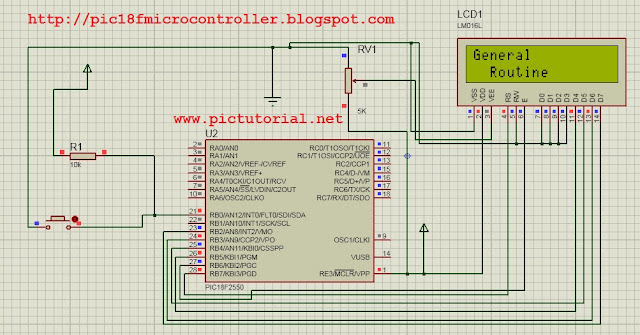 In microcontroller when interrupt happens , the total process is restricted and microcontroller executes only the instructions which are provided into the interrupt function . Consider that we are driving a car on the road . The road is clean and clear. So we are doing what we are supposed to do . Compare this with microcontroller or microprocessor and we find that MCU performs it's general routine at running state like our car. Alright ! . Again consider , Suddenly three Dogs have come to the middle of the road . So we need to stop and get the dogs out of there . After doing that we can move . When we saw the dog , our journey was interrupted and we needed to do a certain process. Compare that with microcontroller. 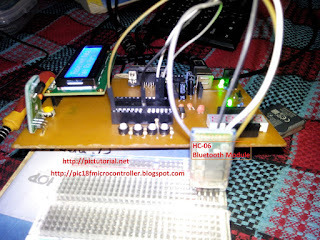 When microcontroller get notification about interrupt, microcontroller forget everything and perform tasks that are written in interrupt function . After doing that MCU get back to it's general routine . 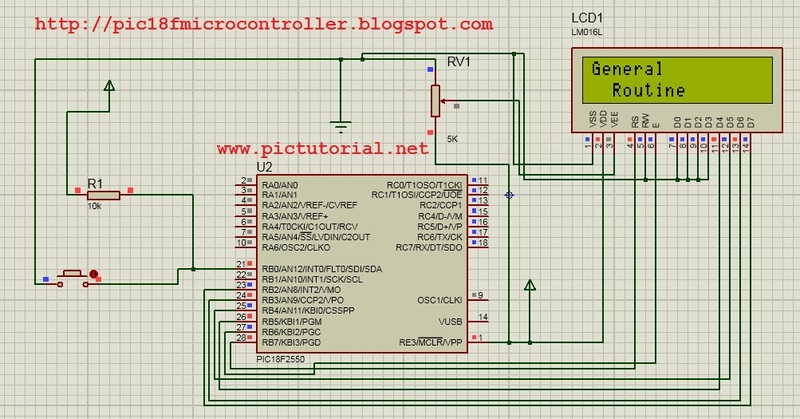 That's the way the microcontroller or microprocessor's interrupt work . Internal interrupts occurs during the time of internal events . Timer overflow interrupt can be considered as one kind of internal interrupt . When timer counts and timer register becomes full with data , on that situation it's required to reset the register so that it can count again . On that situation timer overflow interrupt occurs. Interrupt function clear the register and finally mcu goes to the regular routine . In this Part , i will describe only about External Interrupt. External interrupt occurs during the time of external events . When any external signal comes to the external interrupt pin , external interrupt happens . To understand completely , we will interface a push button with microcontroller and that will provide an interrupt event to the MCU . PIC 18f2550 microcontroller has three external interrupt pins , which are RB0(INT0) , RB1(INT1) and RB2(INT2) . To control these pins we have INTCON , INTCON2 and INTCON3 registers. In this tutorial we will use RB0(INT0) as an external interrupt and we will see an example of this . 1. First set Global interrupt [INTCON.GIE=1] to 1. 4. 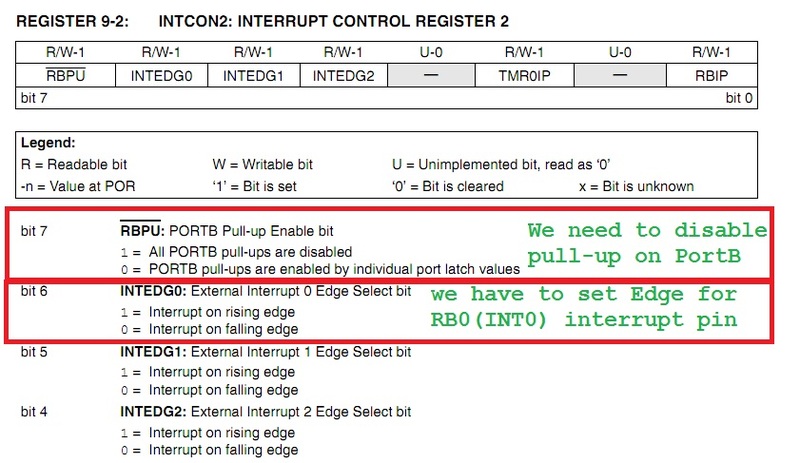 Disable Pull-Ups on PortB [INTCON2.RBPU=1]. 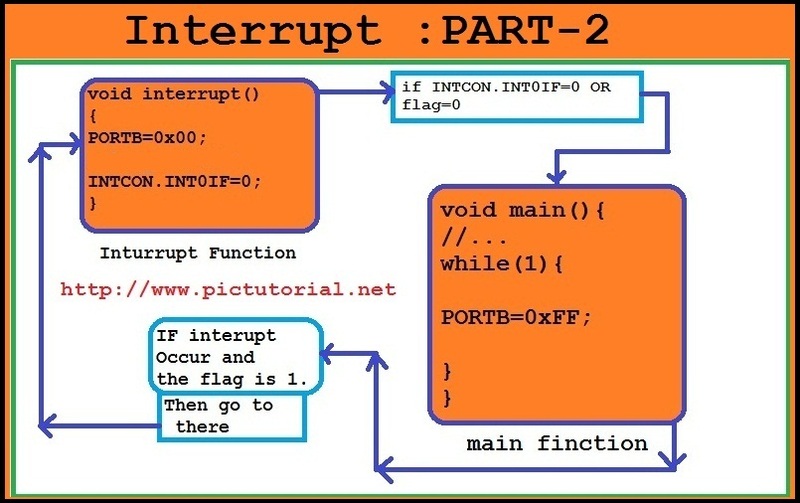 INTCON.INT0IF=0;  // Set the RB0 interrupt flag as 0 . that means no interrupt happens . 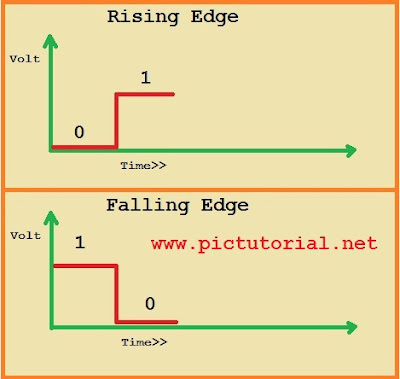 INTCON2.INTEDG0=0;  // Set Interrupt on RB0(INT0) as Falling Edge . It's required to set exact condition of interrupt. That means, which condition can be considered as an interrupt . Is it for from 0 to 1 Condition ? or from 1 to 0 Condition ? Now we will create a project where a push button will be connected with RB0 pin. When button is pressed, the RB0 pin receive a falling edge signal of external interrupt . At that time the MCU follows the interrupt function routine . Listen to me , carefully . 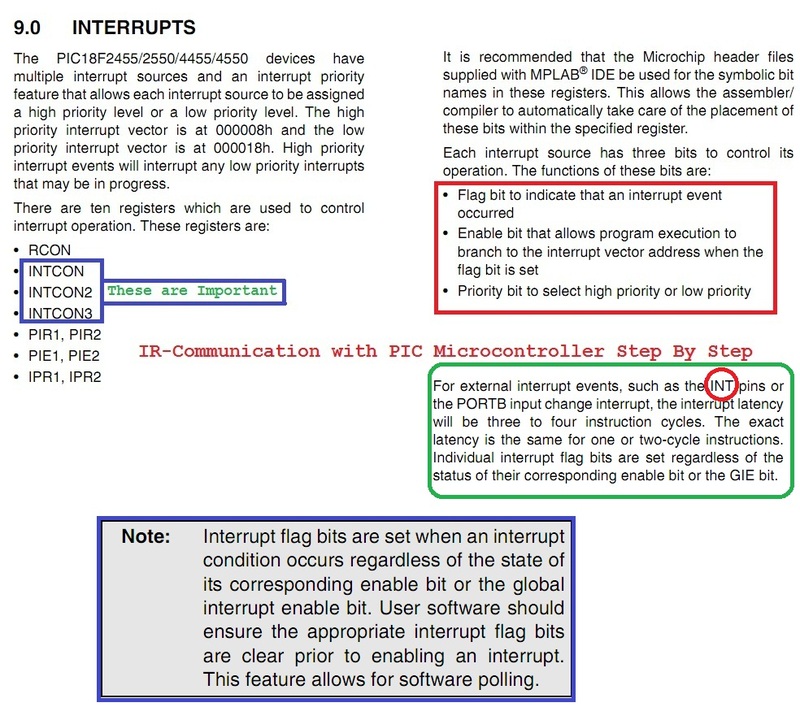 Flag is one kind of indicator .When any interrupt occurs at RB0 pin , this makes INTCON.INT0IF=1;That means RB0 pin related interrupt flag becomes 1 .This gets our microcontroller understand that interrupt has happened. When we set INTCON.INT0IF=0 , microcontroller continues to it's general function routine. 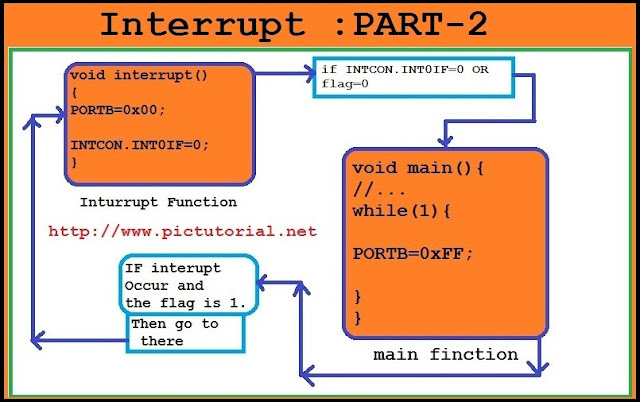 That's why we need to set INTCON.INT0IF=0 in interrupt function and microcontroller goes to perform it's general routine. 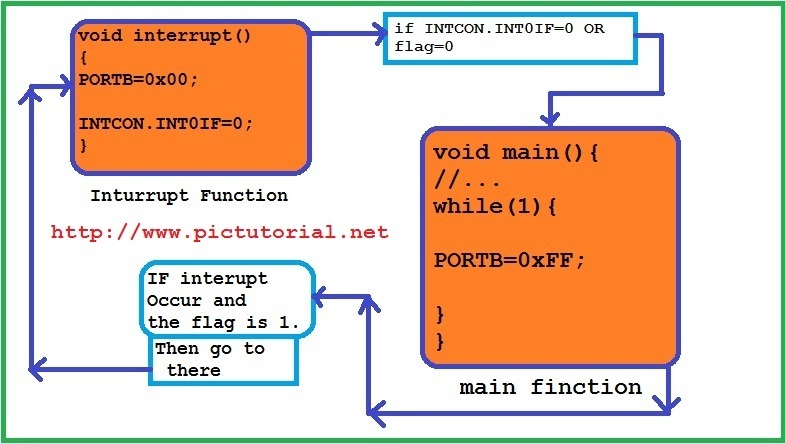 If again interrupt occurs, flag is set to INTCON.INT0IF=1. After this interrupt function makes INTCON.INT0IF=0 and microcontroller goes to general routine.That's all . Note :1. In coding the External Interrupt ( INT ) pin should be declared as digital input pin . 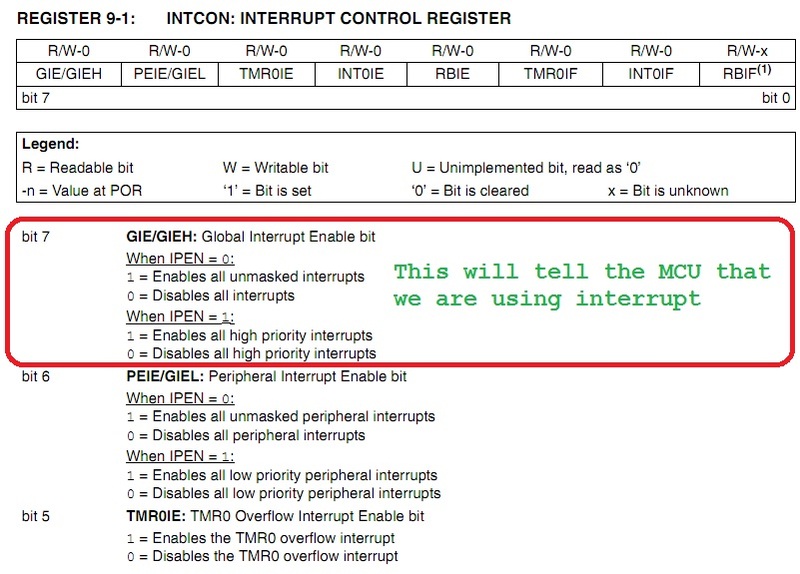 Your microcontroller will automatically understand that it is a interrupt routine . It isn't wise to use delay_ms() function in this case . INTCON.RA4=0; // Set the RA4 interrupt flag as 0 . that means no interrupt happens . // INTCON2.INTEDG0=0; // Set Interrupt on RB0(INT0) as Falling Edge .